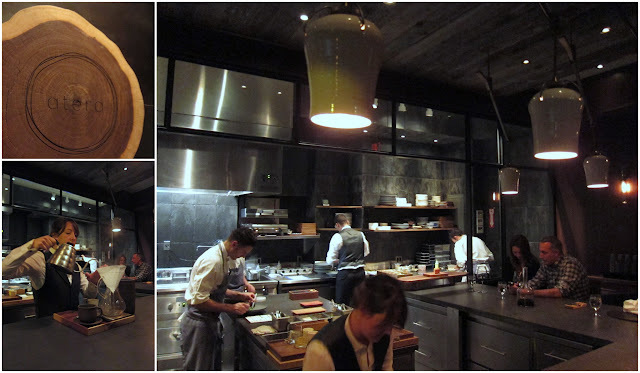 A few months ago, J and I were deciding between dining Chef's Table at Brooklyn Fare and Atera for a celebration in August. While both had very extensive tasting menus, Atera was the newest thing in Manhattan, having just opened in March 2012. The head chef at Atera, Matthew Lightner, also has an impressive resume; he's worked at Noma (currently ranked #1 in Top 50 restaurants) in Denmark and Mugaritz in my favorite place in the world, San Sebastian. Ultimately, we ended up at Atera because I was swayed by Pete Well's glowing three star review of Atera on New York Times. After the beautiful photos from the article, I knew I had to try it. Great thing that we did, because a few weeks after our meal, Atera was awarded with 2 Michelin Stars in 2013! WARNING: spoiler alert! 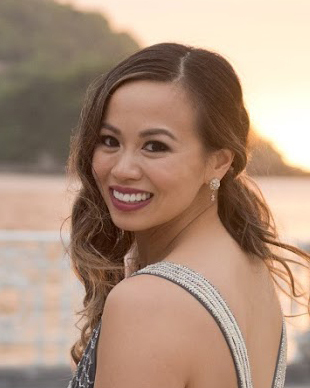 If you plan on visiting in the next half a year, I'd advise staying away from reading through this post completely if you would rather be surprised in your meal. Just know that I recommend this place for a fun unpredictable meal! If you're looking for something that's simple and a bit more traditional, this is not the place for you. Knowing what a great review on NYTimes would do for Atera, we were lucky to have gotten a reservation. J did some research and figured out that reservations came up on OpenTable every Thursday at Midnight - so, Friday 12:00AM. However, the Thursday night that we were supposed to make the reservation, we fell asleep too early. On Friday morning, I woke up at 5AM with only one thing on my mind: Atera! Like a mad woman, I turned on my laptop and hopped on OpenTable and luckily, there were 3 reservations open for 6:30PM, 8PM, and 9:30PM - those turn out to be the standard seating times at Atera. Out of panic, I picked the 9:30PM and woke up J to make a reservation for 8PM, just in case. I was going to be away for work that day and wanted to make sure I was able to fly back in time for dinner. However, 5 minutes after I got my reservation, we saw that the reservation for 8PM was taken by someone else. This means, some kindred spirit (crazy person) was also awake at 5AM making a reservation as well! So now, after this, I'm honestly not sure what time the reservations came up, but I'm glad we had one locked down for 9:30PM. There's nothing that I love more than a great cocktail to begin a great meal. 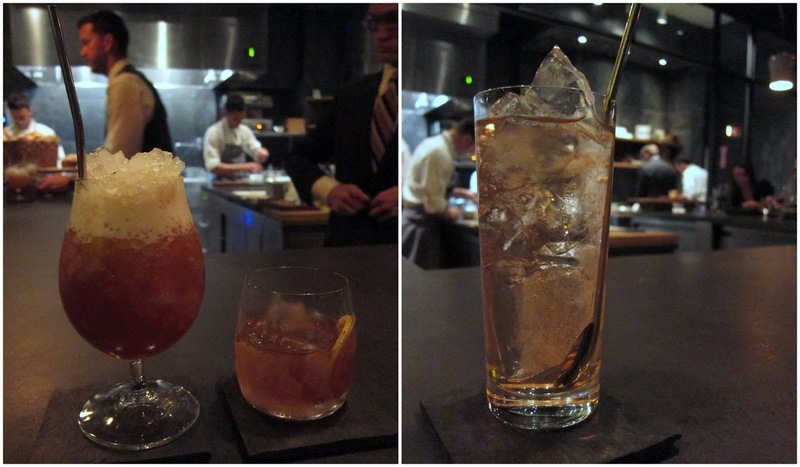 Atera's bartender is a magician in his concoctions. He comes up with special cocktails every week to fit the tasting menu. Our favorite cocktail that he introduced us to is a vintage drink made in the 1800s called the English Milk Punch which took him 2 days to make. He starts off by steeping alcohol, hot water, fruit (pineapple, lemon are amongst a few of many) for a day. Later he adds milk to the concoction so that the citrus in the mixture curdles and he strains it. The result is a creamy fruity drink that is just divine. Here's a close recipe that I've found based on his description. With that much care and attention used to make a cocktail, you can imagine the rest of our dining experience. Fish cured in the style of Iberico Ham - SO Creative! About 8 courses in, J and I discovered that each snack that we tried were all surprisingly likable. Each dish was so playful and just fun to eat. The flavors were all bold in its own way. But it wasn't until we received our uni dish did we really start to appreciate Atera's beautiful flavors. We normally shy away from uni (I know, shocker! ), but the uni at Atera was served beautiful with a smoked tomato ice with the freshest uni buried at the bottom. We originally asked to not be served uni on the tasting menu, but glad we took it back because this dish was in no way fishy, like we've experienced in other tasting menus. There was just enough in the bowl to make us want just a little bit more and the uni was so fresh and creamy. This goes for most of the dishes that we had - Atera just kept us wanting more. 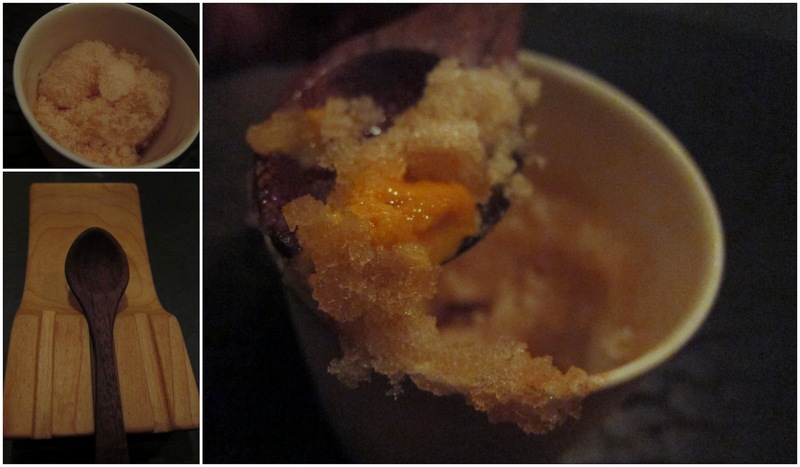 Smoked Tomato Ice with fresh Uni - LOVED! All time favorites - Lamb Tartare with a chip, this combo had the best smokiest flavor, I would order this again in a heartbeat! Then, in addition to that, there are times that you are meant to be surprised. The next dish that was brought out was the ramen. It came in a plain white bowl (I saw the chefs prepping this dish - noodles? Yes please!) with noodles and a clear packet of flavoring, dried herbs similar to what you see in ramen packets. They came with test tubes of broth and poured it over the packet to see it blend in beautifully. As we were eating this dish, J noticed the texture isn't quite like the noodles we know and love. Turns out when we finished eating, the server told us that this was actually blanched squid! 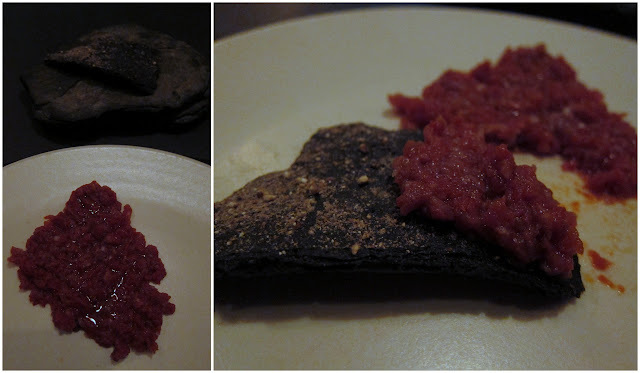 The next dish was one of my favorites, a charred beet that was so dark it was almost black. 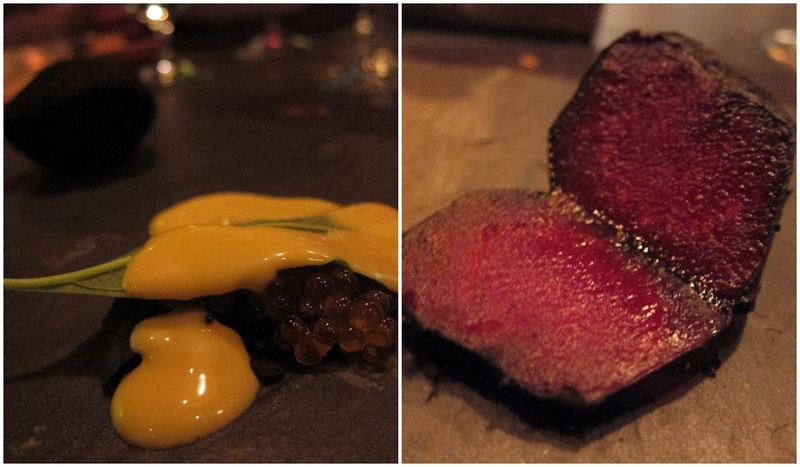 It was paired with a trout roe and topped with a sea urchin emulsion. Cutting through the beet felt like I was cutting through a piece of a beautiful piece of steak and combined with the creamy uni sauce and the pop of the roe with every bite, it was really unlike anything I've seen or tasted. This was a clear winner of the night for me! The next 3 savoury dishes of fish, veal sweetbreads and filet fell a bit flat for me. Perhaps I've just had too many dishes by now and my taste buds were starting to fall numb. But my other guess was that almost everything tasted like it was sous vous (and probably was!). Since Atera is basically a 17-seater restaurant that allowed guests to circle around the open kitchen concept, if anything was actually seared, the filet, for example, then the entire restaurant would have been a crazy smelly mess. That said, I'd say there's definitely a certain level of flavor that was missing from these final dishes that could have benefited from what the Cantonese call "Wok Hay", or the breath of a wok/direct fire. By the end of our savoury dishes, I was pretty stuffed but I opted to try the optional cheese dish. I personally wasn't a fan and found it to be too pungent, and not worth the extra fee to the tasting menu. I would skip it if I ever came back. To finish off the night, we were presented with many fun desserts. One of my favorites was the White Rose made of frozen rosewater served with a wild flower sorbet, this was so pretty and super refreshing as a palette cleanser. Another dessert I found to be super creative was their Peach served with a sunflower toffee ice cream shaped to be like a peach pit. They also had a raw cow's milk ice cream which tasted like cheese to me, and a "fruit" which the server had us guess what it was. A few bites into it, I knew it tasted like tomato paste, so I quickly made the connection that a tomato is indeed a fruit. I didn't finish this dessert since it was strangely sweet and too tart to me. There was also a "Churro" made from some root vegetable and served with a hazelnut sauce and an ice cream sandwich. 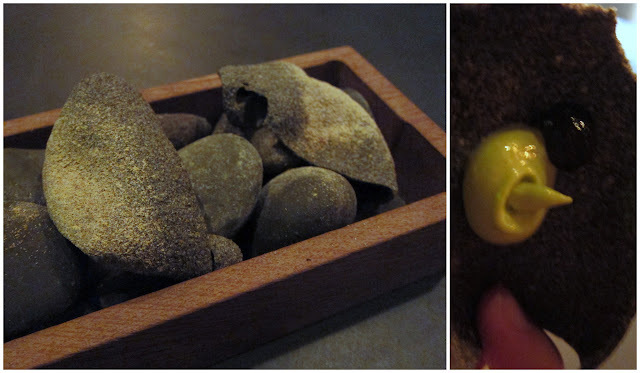 We ended the night with Chocolate Truffles that was shaped like a nut, and served on top of a bed of moss. 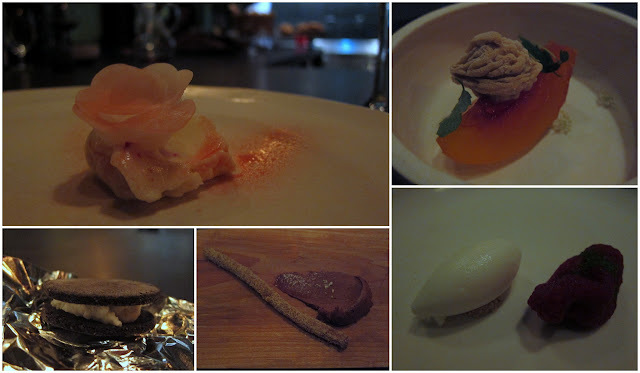 Overall, I really enjoyed the meal at Atera. 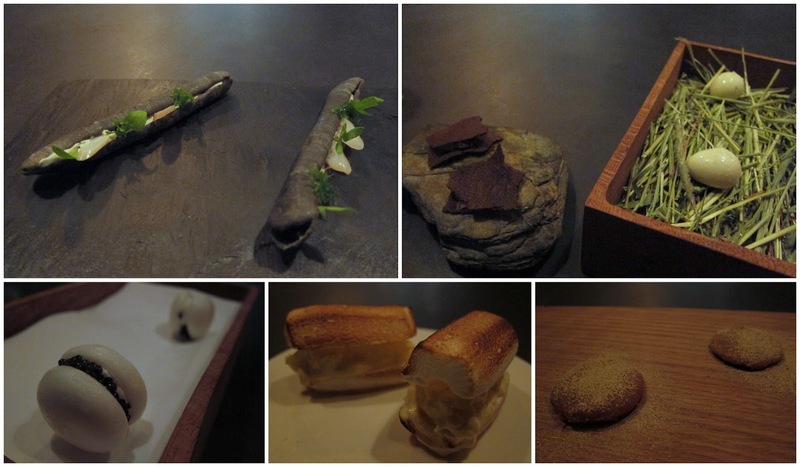 It was clear that the entire tasting menu is inspired and is full of creativity. While I would say that many of the things on the menu aren't things that I would normally be craving or wanting all the time, it was really fun to see how certain ingredients could be manipulated in either flavor or appearance. The service here was great, and overall I would recommend dining at Atera if you're up for championing through 24+ unpredictable courses and a 4 hour meal. It is definitely worth the experience and it's definitely one of the best in Manhattan for Molecular Gastronomy.